Everytime I see a pedal tuner I haven’t seen before on a pedalboard, I lose my mind. “What is THAT?” I wildly shout and point. Then, two things sorta happen: first, my 5-year-old self emerges — “Turn it on! I wanna see the lights!” — quickly followed by ludicrous logic — “Oh, this is totally going to tune my guitar better than the last pedal tuner.” Even stranger still is when I see a new pedal tuner that I think is so cool and I have to have it, I suddenly get the feverish urge to build a new pedalboard around it. That’s how I felt when I tried out D’Addario’s Chromatic Pedal Tuner. 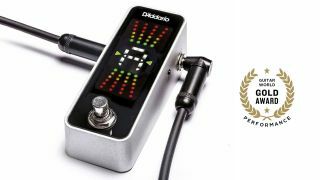 The D’Addario pedal tuner is nicely compact and slim, just about an inch bigger than most mini-pedals, and it comes in what feels like a substantial aluminum housing. It features a 32-bit processor for quick response and fast note detection, superb accuracy, a wide calibration range (from A414-A475) accessed from a side-mounted “pitch” button, and true-bypass wiring with a rugged foot switch. The tuner can be powered by an included 9-volt battery or 9-volt adapter. Its most striking feature is the tuner’s huge full-color vertical LED display — one of the biggest I’ve seen, lit brightly enough to see for miles in daylight or pitch black stages. It’s an intuitive display that uses upper LEDs (lit in multiple yellow and red dots) when the note is sharp, and vice versa for the lower LEDs when the note is flat. Once the note is in tune, it is surrounded by green LEDs and arrows. Does it tune my guitar any better than my last pedal tuner? We all know this is a rhetorical question, but my 5-year-old self is seriously loving the ridiculously huge pretty lights that let me know my guitar is in tune. And yes, I built a new pedalboard around it.